The crazy Essence trend edition mill keeps churning! Most of the items from the Essence Circus Circus trend edition were gone by the time I got to the store(s) but I managed to get my hands on two of the nail polish duos. The shades that I prefer were, unfortunately, already sold out. If the circus did come to your town, I hope you had better luck. Nail polish duos aren't new but they are new to me. 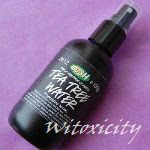 The product design is similar to what you would have seen before in lipglosses and mascaras. Here, you get two different nail polishes in one 'stick'. With this duo, the premise is that you can apply the individual polishes or you can combine the two however you want via, say, layering. Well, in reality, you can do the same with whatever polishes you already possess - the sky's the limit - but what Essence has done is just making it convenient (to carry around). It's a cute thing to have. This is Essence Cotton Candy. For the base layer, I applied one coat of the bright girly pink crème polish. I could have left it at that but oiii, of course, I wouldn't neglect the other bling-bling half! 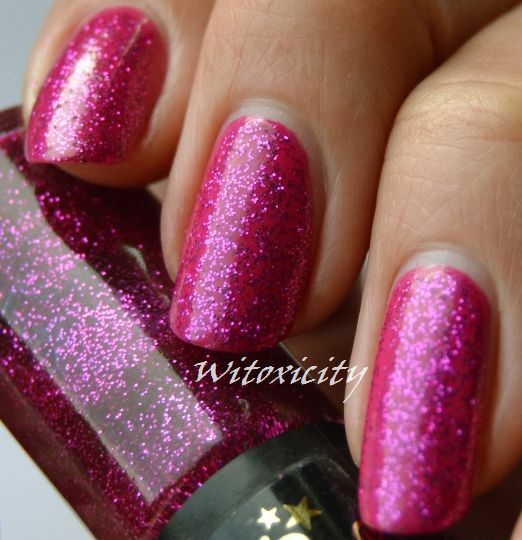 The other half is just pink/fuchsia glitters in pinky clear polish. Layering this on the pink crème polish will give you instant party glam fuchsia nails. 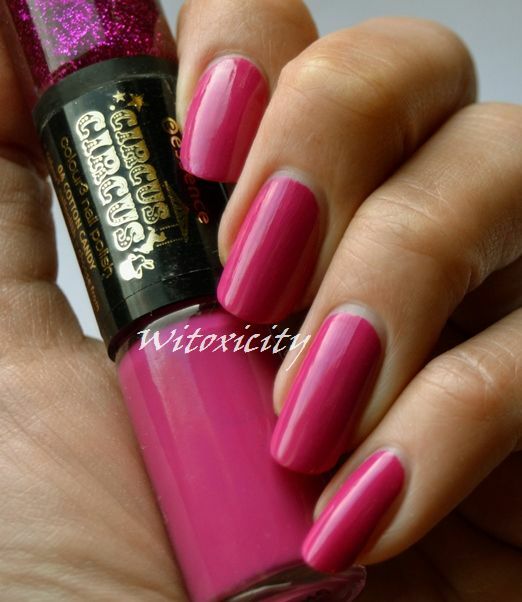 It's a gaudy, eye-catching combination befitting the circus and is perfect for the Party Barbie in you. As is usual of Essence, these nail polish duos are reasonably priced: €2.79 for 2x4ml. I just saw the red and found it gorgeous but I see it's the same for the pink!! Amazing!! I love both versions! This is such a gorgeous fuschia! And the glitter is lovely! It's like we're not even part of Europe!!!! Good job. The base coat itself is really lovely. Essence sells its normal range in the US, so I wish they would also offer their trend editions there too. Hmph! Have a nice x-mas, my dear.